The painting by Nicholas Poussin ( 1594-1665) is in the Wallace Collection in London. Poussin, born in France, painted The Dance during the heart of his career spent in Rome. He painted mythological and religious scenes in a life-long effort to synthesize Renaissance notions of Classical harmony with the energy and emotionalism of the Baroque . The Dance was commissioned by Giulio Rospigliosi (later Pope Clement IX) and painted between 1634 and 1636. Rospigliosi reputedly designated the four dancers as Pleasure, Riches, Poverty, and Work, but they also became known as the four seasons. The picture was purchased by Richard Seymour-Conway, 4th Marquess of Hertford in the Fesch sale in Rome in 1845, where it was sold under the title La Danse du Saisons. Seymour-Conway’s heirs established the Wallace collection as a public museum in 1897 and by at least 1913 the painting was listed in the Wallace catalog as A Dance to the Music of Time. “At a fairly early stage … I found myself in the Wallace Collection, standing in front of Nicolas Poussin’s picture given the titlle A Dance to the Music of Time. An almost hypnotic spell seems cast by this masterpiece on the beholder. I knew all at once that Poussin had expressed at least one important aspect of what the novel must be. 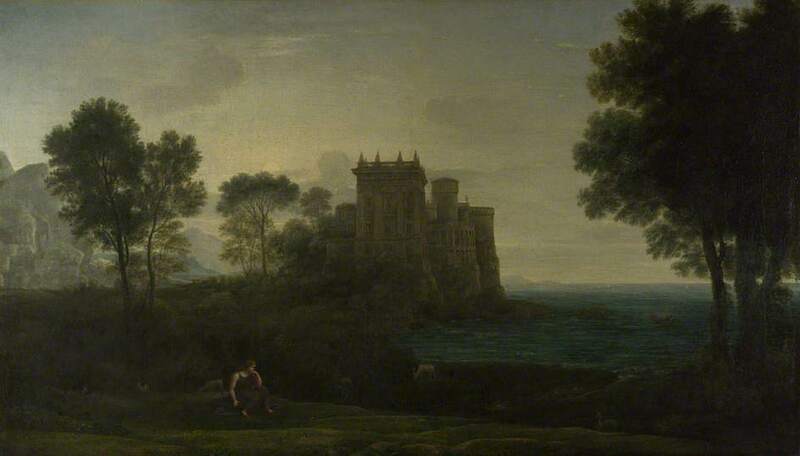 The precise allegory which Poussin’s composition adumbrates is disputed. I have accepted the view that the dancing figures … are the Seasons … Phoebus drives his horses across the heavens; Time plucks the strings of his lyre. A portrait of Duggan is visible at BBC Your Paintings. In TKBR (p.17) Powell writes: ” The ‘real person who sets going the idea of a major ‘character’ in a novelist’s mind always requires change, addition, modification, development, before he (or she) can acquire enough substance to exist as a convincing fictional figure.” Although Stringham looked like Duggan, and they may have had some similar escapades in their youth, Stringham’s adult life in Dance does not parallel Duggan’s. 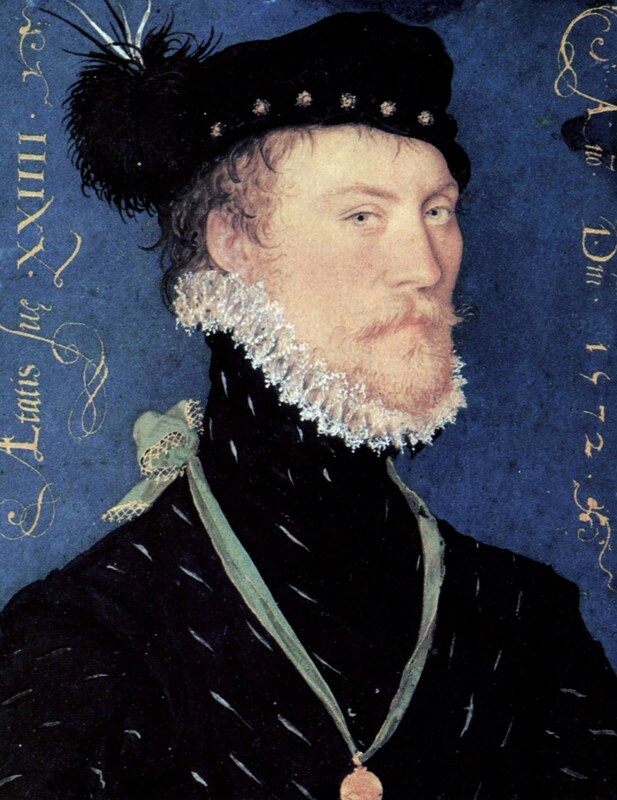 This portrait by Nicolas Hilliard, one of the most accomplished English miniaturists of the Elizabethan period, exemplifies the attributes Powell connects to Stringham’s type. The vivid enlargement of the digital reproduction belies the portrait’s actual size, barely two and a half inches tall. Miniatures such as this, typically painted with watercolor on vellum mounted on card, served the purpose in the Renaissance that wallet-sized photos of loved ones do today. 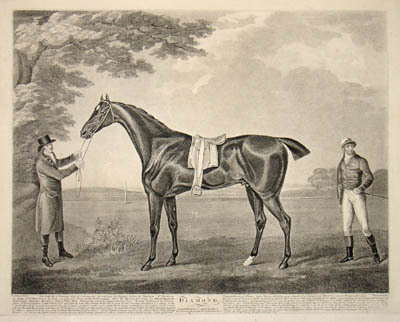 The narrator, describing Stringham’s room at school, notes hanging on the wall “two late eighteenth- century coloured prints of racehorses (Trimalchio and The Pharisee), with blue chinned jockeys” (QU 9/13 ). The sport of horse racing was led by the royal, rich, or aristocratic. Queen Anne founded the racecourse at Ascot in 1711 . 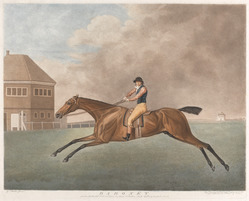 The word “derby” credits the twelfth Earl of Derby who sponsored the races at Epsom about 1780. In the eighteenth century, rich owners would commission oil portraits of their horses, often also showing the owner, sometimes with a jockey. Engravings could be made based on the paintings. The transition from hand coloring of engravings to printing with multicolored inks was an eighteenth century innovation. During his career, John Whessel, whose engravings are shown below, moved from painting and engraving into the potentially more lucrative publishing business. Courtesy of http://www.georgeglazer.com, George Glazer Gallery, New York City. These colored prints became collectors’ items in the nineteenth century. It is very true to type for Stringham, whose mother, as we shall soon see, was a devotee of decor that perpetuated past grandeur, to bring these from home to school. We are entranced by the names of the horses. Animal names can be playful or personal. The eighteenth century British often used classical or historical references. Whessel’s horse prints include images of Trumpator, Parasol, Bobtail, Eleanor, Meteora, Penelope, and Violante. All of these horses are listed in the Pedigree Online Thoroughbred Database, but Trimalchio and The Pharisee are not in the database. Petronius’ Satyricon celebrates the Roman Trimalchio for his debauchery, extravagance, and rudeness. The Pharisees were a devout sect, predecessors of modern Jewish orthodoxy, but many remember the Pharisees only because the New Testament Apostles report Christ’s criticisms of them. We speculate that by using names with negative connotations, Powell is offering a comic signal that these are the first of many instances of imagined works of art in Dance. In about 1921 Jenkins visits Stringham’s mother, Mrs. Foxe, and stepfather, Buster, at their Berkeley Square apartment, whose opulence takes Nicholas back a century. He enters the library, “generally crimson in effect, containing a couple of large Regency bookcases. A female portrait, by appearance a Romney, hung over the fireplace, and there was a malachite urn of immense size on a marble topped table by the window…” [QU 55/57]. This setting illustrates the opulence of the apartment, but at first we do not know how long these objects have been in the family. Regency antiques are easily purchased nowadays on the Internet. 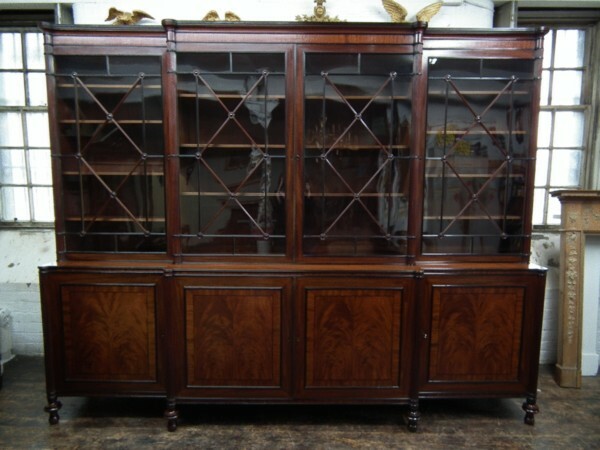 This mahogany book case (circa 1815) was for sale in May, 2013, for 65,000 pounds sterling (www.georgianantiques.net). Prince George was Regent from 1811-1820, but the Regency furniture period in Great Britain encompasses about 1800 to 1830. The style features mahogany, rosewood, and ebony, sometimes supplemented by brass inlays or metal grills, and incorporating classical Greek or Roman motifs. George Romney (1734-1802) (a distant cousin of the American family of politicians) was a prolific and acclaimed British portraitist. He struggled early in his career and was never a member of the Royal Academy but won prizes and developed a fashionable aristocratic following. Romney painted Emma, married to Lord Hamilton, and later mistress of Lord Nelson, over 60 times. 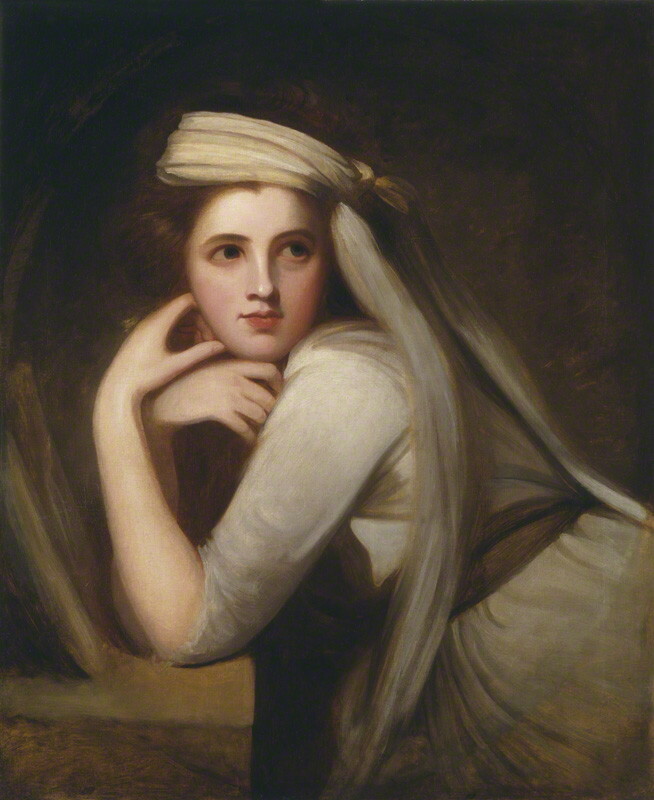 “George Romney specialized in capturing the qualities valued by aristocratic society — health, youth, good looks, and an air of breeding. His refined works are distinguished by easy poses, flowing curves, and an overall elegance of design (Boston Museum of Fine Arts)” For a fuller portfolio of his portraits see the George Romney entry at museumsyndicate.com. Romney was a contemporary of Gainsborough and Reynolds, maintaining a particular rivalry with the latter. 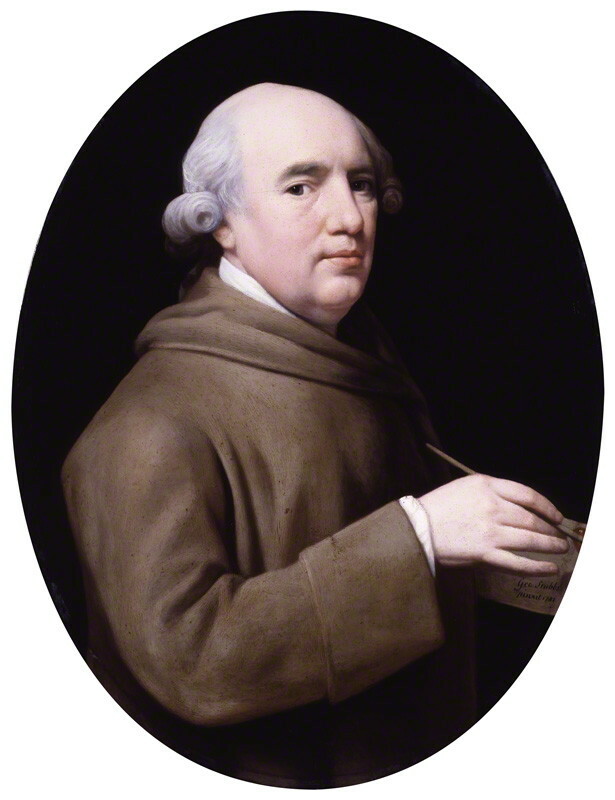 We later will accompany Jenkins when he references these other eighteenth century luminaries. Mrs. Foxe, heiress to a South African gold fortune, might have purchased the bookcase or the painting. 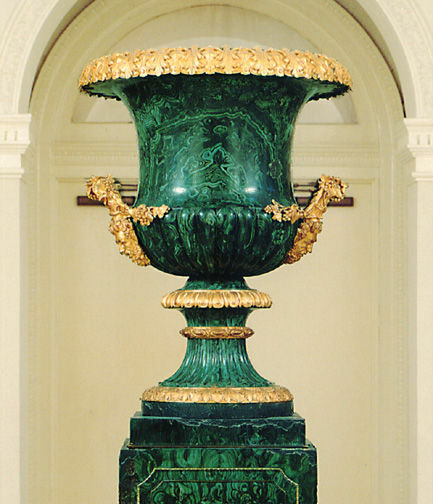 However, the urn, of good Russian malachite from the Ural mountains, had been given to an ancestor of Mrs. Foxe’s first husband, Lord Warrington, by the Tsar early in the nineteenth century. Mrs. Foxe’s urn, though “immense,” might not have been quite so imposing as this one from the Tsar’s palace of about 1830, which was displayed at the Chicago Exposition of 1893 and is now a focal point of the Lightner Museum in St. Augustine, Florida. Jenkins goes with his friend Peter Templer to visit the Templer home, set on a cliff above the sea. 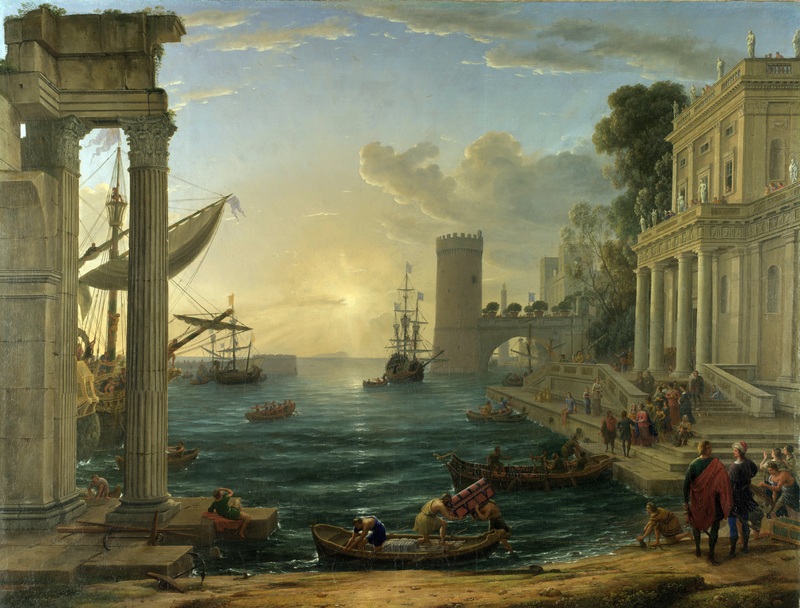 Jenkins first sees the enormous villa with a backdrop of clouds and olive green waves as “a sea-palace for a version of one of those embarkation scenes of Claude Lorraine– the Queen of Sheba, St. Ursula, or perhaps The Enchanted Castle.” [QU 73/74]. Claude Lorraine (c.1604-1682), born Claude Gellée, is often called simply Claude. The Lorraine or Lorrain is added for his native French province. Like his good friend Poussin, he spent most of his artistic career in Rome, where he became a master of the ideal landscape. By the eighteenth century, many of his works had been imported to Britain, souvenirs of aristocrats from their Grand Tours. Lorraine is still in vogue, or at least in vogue again, highlighted with shows at the Ashmolean Museum in 2011 and the National Gallery in 2012. Reviewers have been enthusiasts: “The 17th-century landscape artist, Claude Lorrain, painted trees as other artists might paint mistresses.” (Alastair Sooke, The Telegraph, October 18,2011) “Turner worshipped him, Gainsborough argued that there was no need to paint real landscapes when you had him as an inspiration, and Constable declared him quite simply ‘the most perfect landscape painter the world has ever seen'”. (Adrian Hamilton, The Independent, October 24,2011). For a thorough view of his oeuvre visit Claude Lorraine — The Complete Works. 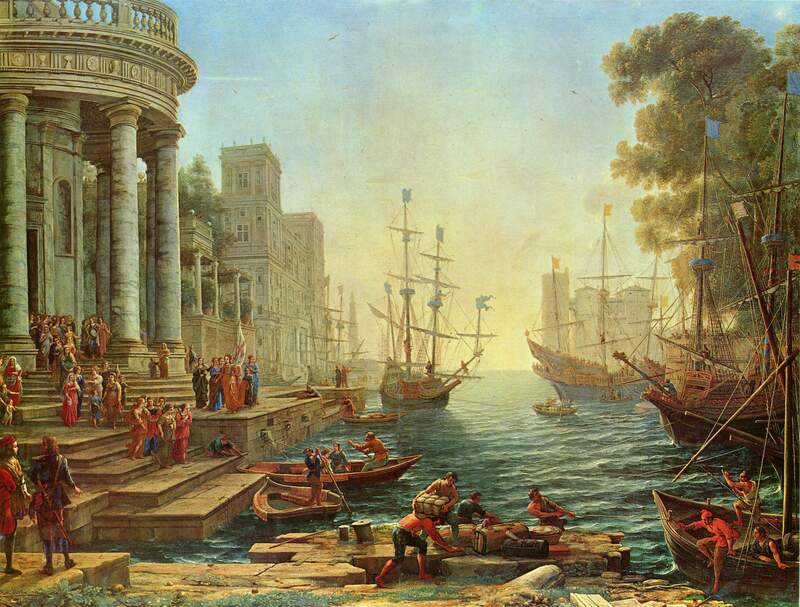 Claude painted many Embarkation and Disembarkation seascapes. Seaport with the Embarkation of the Queen of Sheba (1648) and Port Scene with Embarkation of St. Ursula (1641) share dramatically lit sky and waves with classical waterside mansions, probably not quite like the Templer house, built of brick in the late nineteenth century and set back from the water in a forested park. Another reviewer of the 2011 Ashmolean exhibit considered “The Enchanted Castle” the highlight of the show (Robin Lane Fox, The Financial Times, October 18, 2011) He recalled that when he was at Eton, the painting had belonged to his family for over a century; while home from school on holiday, he would gaze at the figure in the foreground, looking for strength to survive his return to school. The reviewer Fox, in his schoolboy days, saw the figure as another young boy pondering the power of an institution. 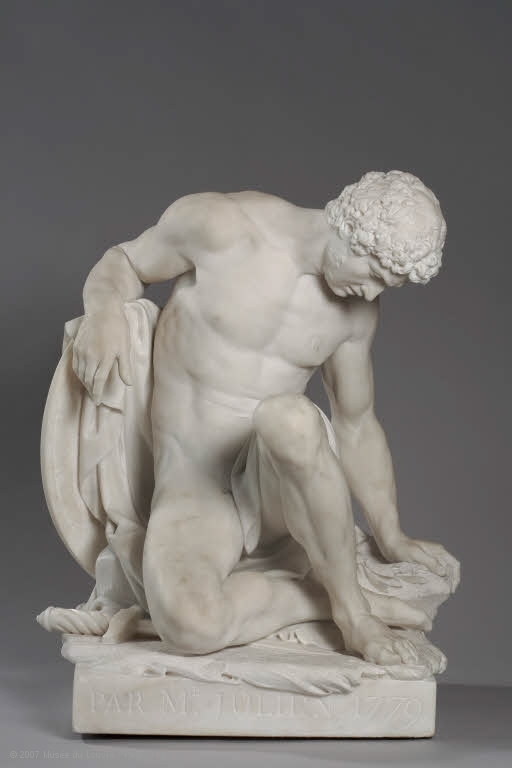 However, the figure is actually the beautiful young girl Psyche; only in retrospect could the narrator Jenkins know how Psyche’s tumultuous relationship with Cupid might have warned him about the girl he is soon to meet. Jean’s appearance is more of a mystery than Stringham’s, who begins from a model of an actual friend of Powell’s, likened to a specifically identified portrait by Veronese. But Powell’s memoir is much less forthright about any romantic interest beyond his wife, and his evocation of Jean Templer is suitably and deliberately elusive. It would be a fool’s errand to try to nail down Jean’s image in art, but we tried to identify the class of images that Nick imagines when he first meets Jean. 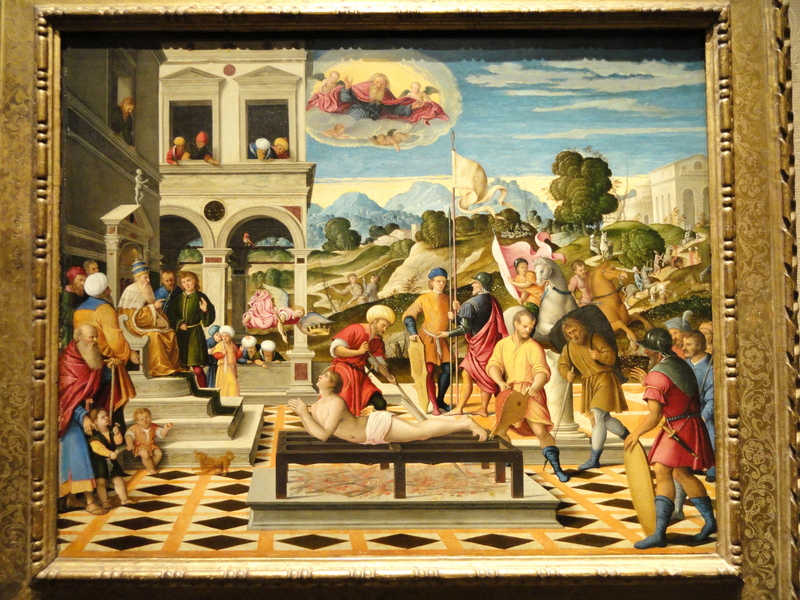 The Narrator seems to be recalling a Northern Mannerist work with long bodies derived from the gothic tradition. 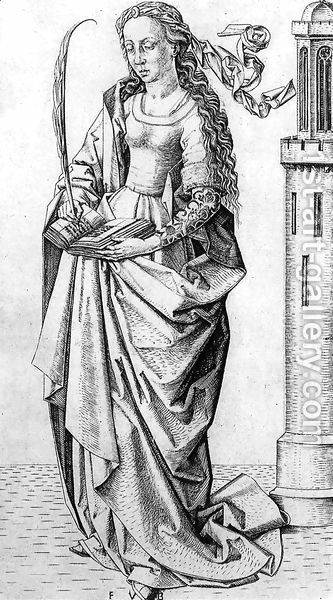 We chose this late-15th century Flemish wood engraving of Saint Barbara to illustrate the simplified lines and planes to which he alludes. Saint Barbara herself—whose muddled story of doubtful authenticity dates from about the 7th c. AD—bears no resemblance to Jean’s story. But her bodily proportions are at once child-like and elegant, her pose both charming and slightly awkward. This evocation of the mysterious ambiguity of Jean’s appearance put us in mind of this well-known painting by Lucas Cranach the Elder (1472-1553) of Venus with Cupid, from about a half-century later than the Saint Barbara engraving. Here is no virginal saint, but her physical proportions recall her gothic origins and her facial expression goes a long way to help readers imagine what Powell might have had in mind. When we first saw the name Isbister, Powell’s first fictional artist, it stirred memories of Elstir, Proust’s paradigm artist among his contemporaries, yet there is no evidence that Powell had Elstir in mind. Others have also speculated about the name: that it derives from a location on Shetland or Orkney; that it memorializes the first British victim of a bomb in World War I; that it recalls another artist Ibister in a story by HG Wells. When asked about this name game during an interview for the Paris Review, Powell just laughed. Isbister is an olio of artists, but we are not sure of which. One clue is the R.A. that closely accompanies his name. The Royal Academy of Arts in London is an independent group of artists and architects, founded in 1768 by George III, with a self perpetuating membership, currently numbering 80. 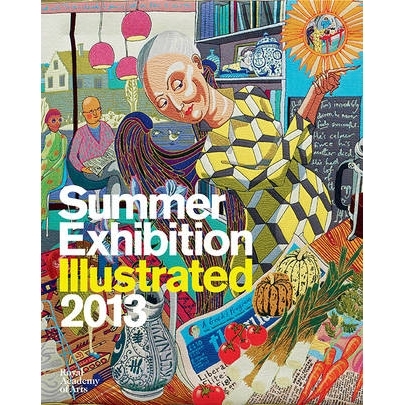 The Royal Academy of Arts Collections website lists all current and former members. We have reviewed RA painters born before 1900 and elected to the Royal Academy by 1920 looking for possible models of Isbister. The Royal Academy at that time was known for its inclusion of conservative academicians, occasionally even hacks , but never, by any means, untalented amateurs. However, in the twenty-first century Royal Academy exhibitions are hardly drab or old fashioned. 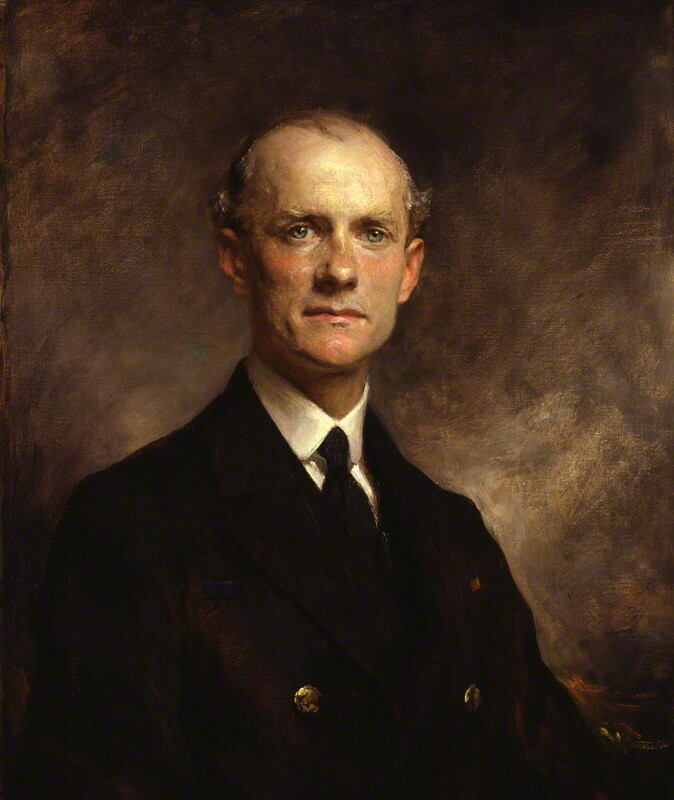 We suggest that the portrait of Alfred Carpenter by Sir Arthur Stockdale Cope shares characteristics with Isbister’s portrait of Templer. Cope, like Isbister, was an extremely successful portrait painter. He started exhibiting at the Royal Academy and the Royal Society of Portrait Painters by age 19 and by 1935 had shown 288 works at these institutions. He painted Kings Edward VII, George V, and Edward VIII and many of the rich and aristocratic. Some of the issues related to portraiture and the advent of Modernism are explored by Eric Kandel in The Age of Insight. Kandel claims that the primate brain prefers facial images when the features are exaggerated, even when carried to the point of caricature. Isbister painted Templer’s feature “a little larger than life. ” Some of his contemporaries, like the Austrian Expressionist Oscar Kokoschka, used this attenuation of physical characteristics to give their portraits strong psychological power, but the price of this power could be the displeasure of the sitter. 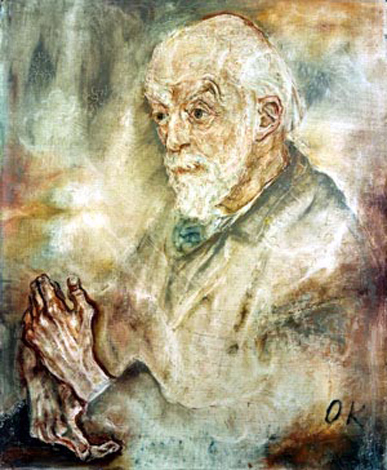 The famous neuroanatomist Auguste Henri Forel refused to buy this portrait that Kokoschka painted of him in 1910. Society painters like Isbister may maintain their popularity by using only just enough emphasis and exaggeration to please their clients. The introduction of the work of the immensely successful Horace Isbister, R.A. described by Nick with undisguised derision, is the first sighting of a recurrent theme in Dance, the way in which the advent of Modernism in the arts forced the reappraisal of practitioners past and present. Isbister is one of many characters (e.g., Deacon, Barnby, Tokenhouse, St-Jean Clark, X. Trapnel, Moreland, etc.) whom Powell challenges the reader to locate in the categories of master, amateur, charlatan, or genius–recognized or unappreciated. Jenkins, in France for a summer of language study, rides with a taxi driver, who looks like “a Napoleanic grenadier, an elderly grognard … depicted in some academic canvas of patriotic intent” (QU 108). 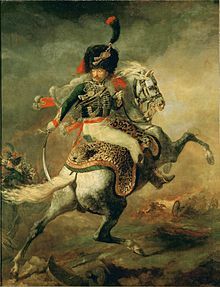 Napoleon’s Grenadiers were his Imperial Guard, his most elite troops, and the Grognards were the Old Guard, creme de la creme. There are abundant paintings and prints of these famous troops, but which qualify as academic? The French Academy of Beaux Artes could trace its orgins to 1646. Like the Royal Academy in London. it was a bastion of establishment art. 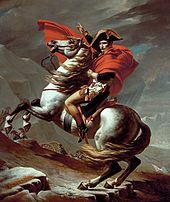 In the Napoleonic era it was dominated by the Neoclassicism of artists like Jacques Louis David or Ingres, but more romantic painters like Gericault were also exhibited at the Academy’s Salon. St. Laurence was a third century A.D. scholar of Spanish origin, appointed deacon of the Church of Rome by Pope Sixtus II. Laurence’s was martyred by being cooked alive on a gridiron, and legend has it that the good-natured saint said, “I’m done on this side, turn me over.” Powell’s choice of St Laurence for Nick’s cell is apt, since Nick immediately cooks a bit on his own grill in an apparent bout of food poisoning. Jenkins describes M. Dubuisson: “His upper lip and general carriage made me think of a French version of the Mad Hatter.” [QU 114 /116]. This is the first of many references in Dance to Alice in Wonderland by Lewis Carrroll. John Tenniel’s (1820-1914) original illustrations for Alice in Wonderland are so well-known and closely linked to the book, that that the image above of the Mad Hatter must have been what Jenkins had in mind. Tenniel studied art at the Royal Academy and was already a famous cartoonist for Punch when Carroll approached him to illustrate Alice. Carroll initially planned to illustrate it himself, and Tenniel worked closely with him in planning the ninety-two drawings for Alice and for Through the Looking Glass, which are now among the best known book illustrations. For the book, Tenniel’s drawings were engraved on wood blocks by the Brothers Dalziel; the blocks, now at the Bodleian Library at Oxford, were masters for electrotypes in the book. The phrase ‘mad as hatter’ was in use in the eigthteenth century, preceding Carroll’ s work. Hat makers often became psychotic because of the toxic effects of the mercury solution that they used to process fur. However, H.A. Waldron, in an essay the the British Medical Journal, argues that The Hatter’s personality was not typical of mercury toxicity and that Carroll actually based the character on an eccentric furniture dealer who always wore a top hat. In this illustration from chapter seven A Mad Tea-Party, The Hatter is reciting the poem parody, Twinkle, Twinkle, Little Bat. Is Jenkins referring only to M. Dubuisson’s appearance or implying that his French host was a constant source of nonsense, like The Hatter, who spouts non sequiturs and unanswerable riddles to our delight? Millais was a founding member of the Pre-Raphaelite movement. but by the time he painted The Boyhood of Raleigh, he was more influenced by Old Masters. 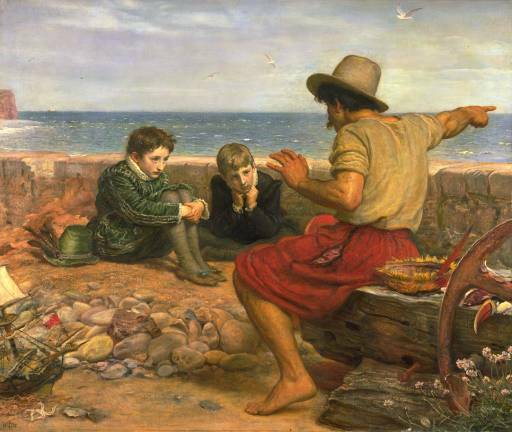 He painted The Boyhood on location at Budleigh Salterton, near Raleigh’s birthplace, using his sons as models. Millais was a member of the Royal Academy, serving as its president briefly in the year of his death. 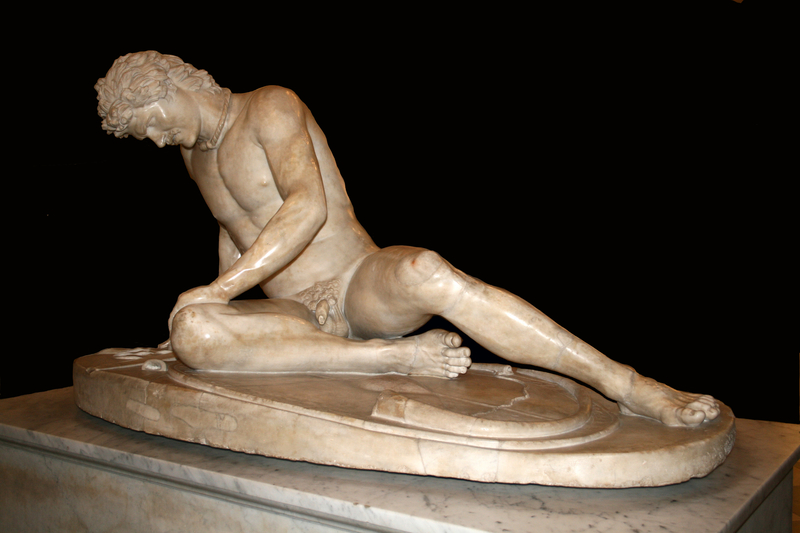 Marble, copy of one of the statues Attalus I gave to Athens (3rd century BC). 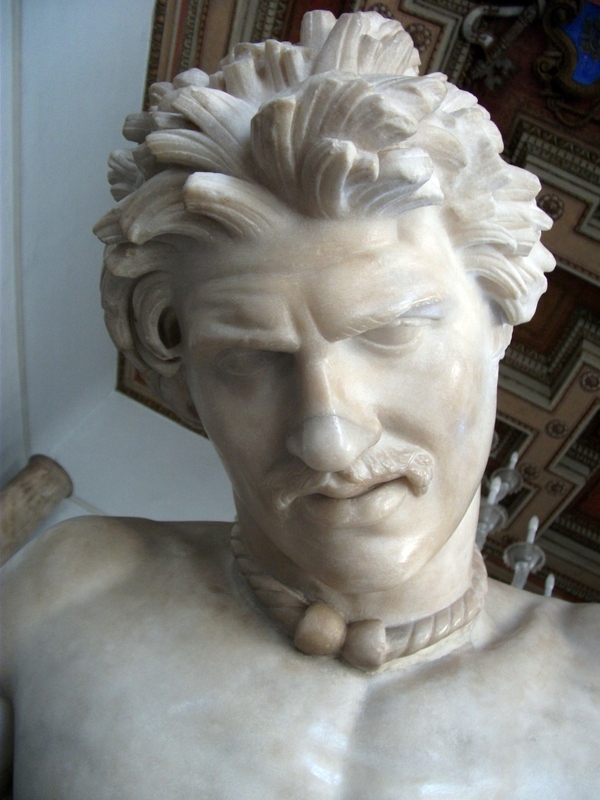 Gaul or Celt; the original bronze, of which the Capitoline marble is a Roman copy, was commissioned about 225 BC by Attalus I of Pergamon in Anatolia to commemorate his victory over the Gauls or Galatians. The grimace of the dying beautiful boy, of which Byron says, “his manly brow consents to death but conquers agony,” may remind us of Member’s discomfort in Quiggins’ presence. “Rain had been falling while we were at tea, but the pavements were now drying under wooly sky. 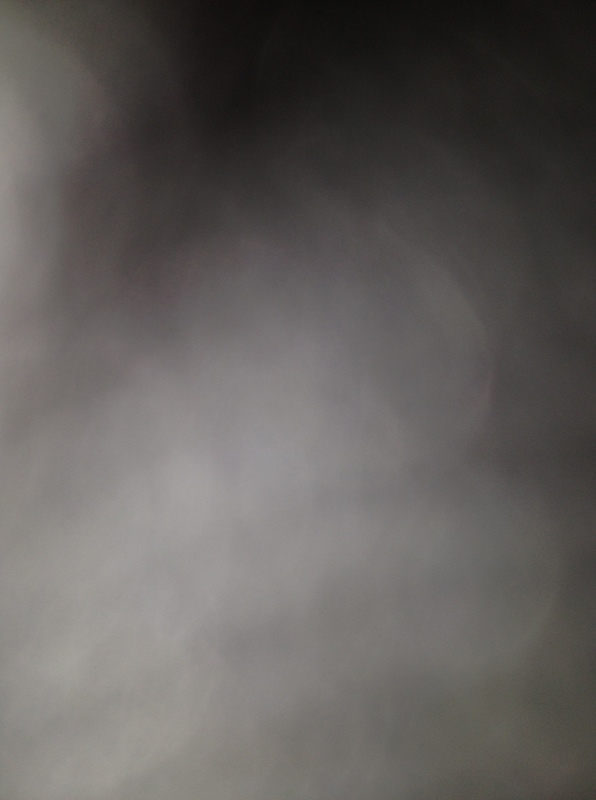 We took a photo of the sky . With Powell’s prompting, we easily saw the resemblance of the confluent fluffy stratocumulus clouds to a large unshorn lamb. Members’ mumbling about Monet is another matter. So far in Dance the Narrator has alluded to works of art to explicate what he sees or feels or has used visual examples to help describe a place. Here, instead, the allusion comes from a character and presumably reveals something about the speaker. What do we learn about Member’s from what he says? Monet is much more modern that the artists the Narrator has chosen for his allusions, but by the early 1920s, Monet was well known and hardly avant garde. So Members may have artsy pretensions, but he is prosaic, neither a classicist nor on the cutting edge. Monet is now among the best known Impressionists. He was a master of, among many things, cloudy sky. We already know from Sillery’s party that Members is clever, but what is he saying about the weather? Is he comparing the weather to a beautiful sunny day along the Seine at Argenteuil or to threatening clouds above the Thames in London? 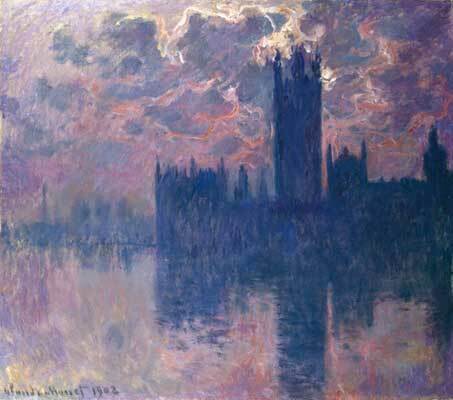 Monet is renowned for painting a scene, haystacks, or Rouen cathedral, or the Houses of Parliament, repetitively examining the visual effects of changing light. (A number of websites including Wikimedia Commons show other examples from the Houses of Parliament series). photo public domain from Wikipedia Commns. National Gallery, Washington , D.C. The jocular playboys make it clear that our earlier guess at the appearance of the horse prints was incorrect when we chose unmounted horses. George Townly Stubbs worked from a painting by his father, George Stubbs (1721-1805) one of the best horse painters of his generation. 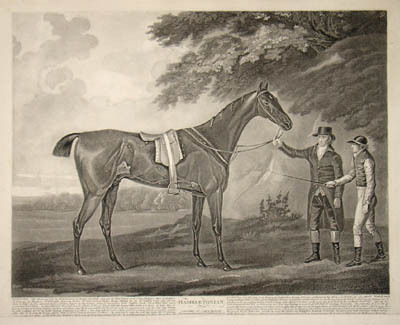 The elder Stubbs studied anatomy and published the Anatomy of the Horse. He received many commissions from the noblemen who founded the Jockey Club. He exhibited at the Royal Academy, which now has a collection of his anatomic horse studies; however, as a sporting painter, the Academy offered him only associate membership, which he declined. The etching was done with stippling (more information about this technique is available at Graphics Atlas) and hand painted. G.T. Stubbs was engraver to his Royal Highness the Prince of Wales. The etching was republished June 4th 1817 by Edw.d Orme, Bond Street, London and as of June 30, 2013, there were copies for sale at Grosvenor Prints, for those who want to emulate Stringham. 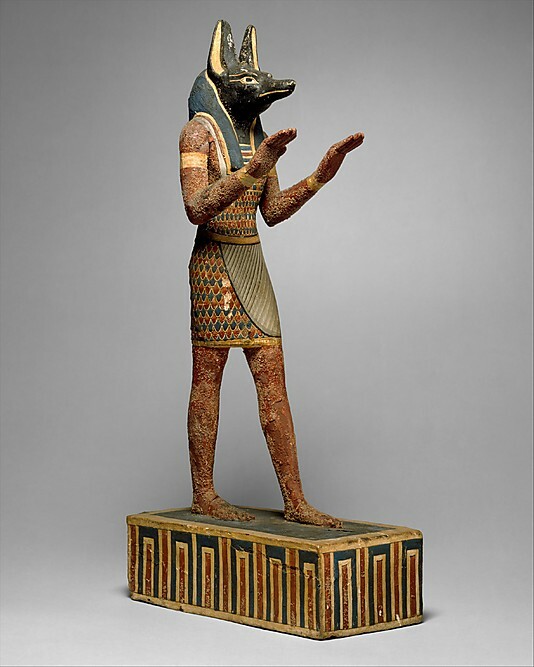 When we read this, we had an immediate image of Le Bas — stiff and angular, yet when we tried to find pictures, whether of an Egyptian god or from the tapestry, with the arms in just this posture, we had trouble finding the exact hand position. Rather, the styles of Pharaonic Egypt or Romanesque Normandy perfectly convey the formal Edwardian Etonian housemaster. 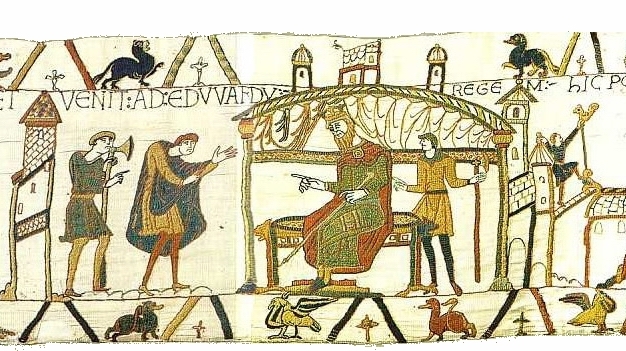 The Bayeux tapestry was commissioned about 1070 by Bishop Odo of Bayeux, Normandy to tell the story of the conquest of England in 1066 by his half-brother, William the Conquerer. Rather than an actual tapestry, it is a nearly 75-yards-long, 19-inches wide strip of embroidered linen, telling its story in 50 scenes. Powell has said: “It is a work of propaganda, of course, but propaganda that has taken art into close alliance” (SPA… p.171). Some of the cartoonish nature of the tapestry might reflect the constraints of embroidery, but even the painting of the time, now classified as early Romanesque, showed flat fiqures with little perspective. If anything, the size of a figure might represent the importance of the person rather than the position in three dimensions, and there was little attempt at realistic portraiture. Ancient Egyptian artists painted gods as two dimensional figures using stylized conventions (see The Art of Ancient Egypt, The Metropolitan Museum of Art). The shoulders are seen from the front; the torso and hips are turned 90 degrees, so that the head, arms, and legs are in profile. The height of a figure might indicate its importantance, and ratios are specified, so that a face would always be 2 palms high, a full body 18 palms high. The pose of the arms had specific icongraphic meaning, Sculpture added a third dimension but maintained the stiffness and formal iconography. I´m a german and just started reading the first part of “Dance”, which is newly published by Elfenbein in Germany. Like Proust, Powell references as much to all kind of paintings. On behalf of Proust there is a book by Eric Karpeles “Paintings in Proust”, you might already know.about. With further reading I will follow your blog and hope the last three volumes will also appear in the future.